We have some exciting new dates to announce! The boys will be teaming up with Béla Fleck & Abigail Washburn for a handful of shows this summer in Cincinnati, OH, Chautauqua, NY, Roanoke and Vienna, VA. After parting ways with Béla and Abby, they'll stop by Raleigh, NC for a show at the North Carolina Museum of Art. The on-sale dates vary a bit so you'll have to check the specifics on the tour page. The Winter Tour is nearly wrapped up and it's been fantastic seeing so many of you who were able to come out in spite of the snow that chased us down the East Coast. Things finish off later this week in Philly, NYC, Boston, and Portland, ME with Gaby Moreno. 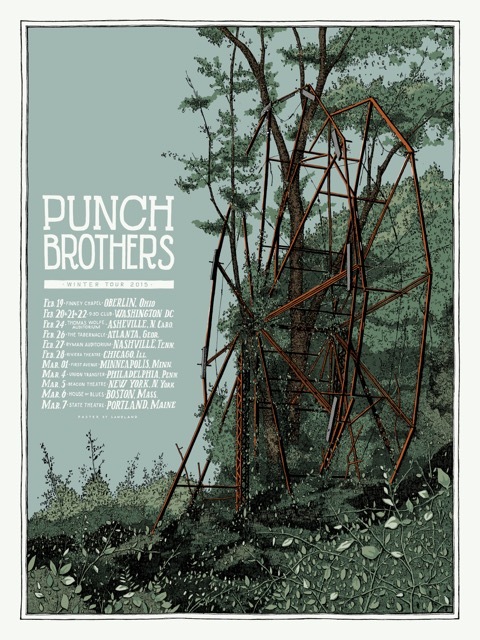 Here's the limited-edition tour poster, designed by the fine folks at Landland, that we've been selling during this run. If we don't run out of stock at the final four shows, they'll be added to our shop so keep an eye out. Later this month, the next leg of the tour will kick off out west with Gabriel Kahane in tow. Since we last wrote, we've added a second night in San Francisco on April 4th as the first night sold out. In other non-West Coast tour additions, the boys will be performing at FreshGrass Festival in North Adams, MA this September. 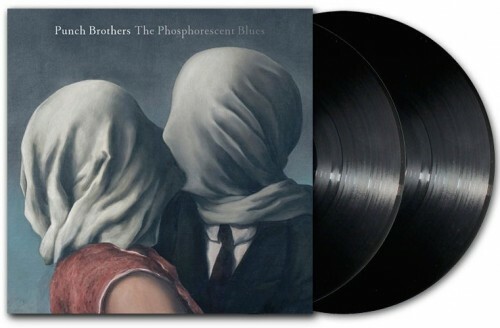 The Phosphorescent Blues was just released on vinyl this past week! You can pick it up in our shop or at your local record store but if vinyl isn't your thing, there's always iTunes or the full digital download that comes with each ticket to our upcoming tour. A bit of an explanation about the vinyl-exclusive tracks as a few of you have asked: it mostly came down to a matter of practicality as we couldn't fit the record on two sides of vinyl which meant we needed a second disk/a third side. We had a few extra songs sitting around that we were pleased with so we chose to include those on what would have been an otherwise-empty fourth side. Those tracks will most likely make it into digital format at some point and we'll be sure to let you know when we have specifics. We'll leave you with a few things to watch that you may have missed. Here's Debussy's Suite bergamasque: 4. Passepied from A Prairie Home Companion, "Magnet" on Conan, and a series of songs performed Live @ CMT.